Disulfide bond (S-S bond) is formed by oxidation of the sulfhydryl group (-SH) on two cysteines in the protein. It is an important post-translational modification of protein. Disulfide bond is essential for protein molecules to maintain the correct advanced structure and maintain protein bioactivity. 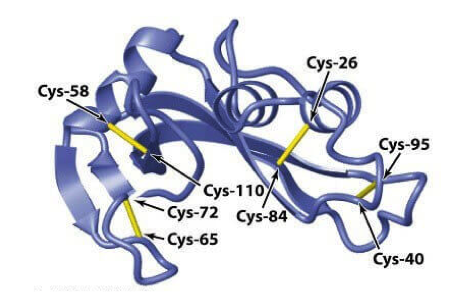 The distribution of disulfide bonds in antibody drugs is a direct structural characteristic of the drugs. Therefore, confirmation of disulfide bonds plays a very important role in the confirmation process of antibody drug structure. MtoZ Biolabs has developed a high-resolution mass spectrometry, coupled with pLink-SS software, to provide our customers with accurate analysis of disulfide bonds and free cysteines. Our sample preparation steps have also been optimized to prevent in vitro exchange of disulfide bonds, and maintain native structure.